Add great features to your shower set-up that will add a touch of luxury for you, and safety for your whole family. The GROHE Grohtherm 800 shower thermostat with GROHE Tempesta shower set includes a 900mm shower rail for easy height adjustment. Select the soft, relaxing Rain Spray or the powerful Jet Spray – GROHE DreamSpray technology will ensure an even flow from every nozzle while GROHE TurboStat technology will ensure the selected temperature stays constant for the duration. Concerned about conserving water? 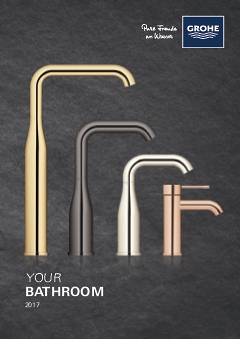 The GROHE EcoJoy function will reduce water consumption by up to 50% without compromising enjoyment. Great for families, the GROHE SafeStop system offers a temperature limit preset at 38°C to prevent scalding while the InnerWaterGuide means the surface of the shower will never be too hot to touch. Durable and easy-to-clean, the GROHE SpeedClean anti-lime system lets you clean the shower nozzles with a brush of your finger, and the dazzling GROHE Starlight stainless steel finish is scratch-resistant for a pristine look for years to come.